THOUSANDS of knitted poppies will cover the village of Bembridge to mark the 100th anniversary of the end of the First World War. Over the last few months, the Rev Amanda Bloor, the vicar of Holy Trinity Bembridge, with the support of the parish council, has encouraged local people to knit, crochet and sew the poppies for this display. The poppies will be strung together and hung along walls and fences from November 9th, to link Holy Trinity Church with the village War Memorial, and the churchyard at St Luke’s, where there are Commonwealth war graves. The poppies are part of Bembridge’s wider commemorations, including the ‘There But Not There’ installation in Holy Trinity Church, where three silhouetted figures represent the men who left the village to serve their country and never came back. 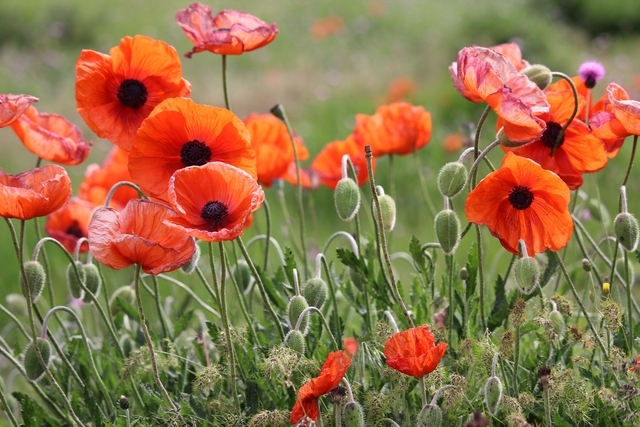 Large numbers of people are expected to attend a special Communion service at 9:30am on Remembrance Sunday, and the Act of Remembrance at the War Memorial featuring music from an ex-RAF servicewoman, and two ponies representing animals who went to war. The service will be followed by an indoor street party at the Parish Hall, with refreshments provided by the Women’s Institute, and with music from the era of the war.